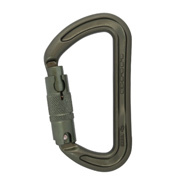 How do you decide between an auto-lock or a screw gate carabiner? Generally speaking, I choose auto-locking carabiners for use on helicopters. They don’t vibrate open, and noise signature isn’t as big a deal. Auto-locks have a tendency to make a loud noise as they are released to close and spin into the lock position. I use screw gates for tactical ground rope work, be it urban or mountain. It is much easier to control the gate close, reducing the sound signature, and they are lighter weight, less prone to failure from corrosion and dirt, and less expensive. A few things to ponder the next time you’re buying and packing carabiners for a task. Keep in mind, this is for tactical applications, and is not a hard rule. For aid climbing, I’ll usually use twist locks on my daisy chains.